James Timothy McCarver (born October 16, 1941) is an American sportscaster and former professional baseball catcher. McCarver played for the St. Louis Cardinals, Philadelphia Phillies, Montreal Expos, and Boston Red Sox between 1959 and 1980. He appeared in the MLB All-Star Game in 1966 and 1967, and was the starting catcher for the World Series champion St. Louis Cardinals in 1964 and 1967. After his playing career ended, McCarver began a career as a broadcaster, most notably for Fox Sports. McCarver called a then-record 23 World Series and 20 All-Star Games. He was the recipient of the 2012 Ford C. Frick Award for broadcasting. McCarver was born in Memphis, Tennessee. McCarver, following his years with Memphis' Christian Brothers High School, was signed by the St. Louis Cardinals in 1959. Playing with the Cardinals' minor league teams of Keokuk and Rochester, McCarver reached the MLB level for the first time at the age of only 17. He spent the 1960, 1961, and 1962 seasons shuttling between St. Louis and the minor league teams of Memphis, Charleston (West Virginia), and Atlanta. In 1963, he was called up to the majors for good. In 1964, his tiebreaking home run in the 10th inning won Game 5 of the World Series. In 1966, McCarver was named to the All-Star Team, scored the winning run in the 10th inning of that 1966 All-Star Game, and became the first catcher to lead the National League in triples, with 13. In 1967, he finished second to teammate Orlando Cepeda for the National League Most Valuable Player award. McCarver was a member of two World Series championships during his time in St. Louis. He was the favorite catcher of the notoriously temperamental Bob Gibson, and fostered a relationship with young pitcher Steve Carlton that would keep him in the major leagues later in his career. In 1968, he was the Cardinals catcher as they took the NL pennant but lost to the Detroit Tigers in a seven-game World Series after being up 3 games to 1, the Tigers being only one of 6 MLB teams to accomplish that feat. After a trade to the Philadelphia Phillies involving, among others, his teammate Curt Flood (which led to Flood's lawsuit over baseball's reserve clause) before the 1970 season, McCarver played for the Phillies, Expos, Red Sox, and another brief stint with the Cardinals (he was replaced on the roster by the rookie Keith Hernandez). McCarver's career might have taken a different turn in 1975, when, according to Peter Gammons, McCarver (then 33 and Boston's third-string catcher) was rumored as a potential managerial replacement for struggling skipper Darrell Johnson. McCarver, however, was released (to return to the Phillies), and Johnson led the Red Sox to the '75 AL pennant. During his first stint with the Phillies, McCarver caught Rick Wise's no-hitter on June 23, 1971. At the end of the season, the Phillies traded Wise to the Cardinals for Steve Carlton, the deal reuniting McCarver with Carlton. During the 1972 season, the Phillies traded McCarver to the Montreal Expos where, on October 2, he caught the second of Bill Stoneman's two career no-hitters. On July 4, 1976, McCarver hit what is known as a "Grand Slam Single" when, after hitting a grand slam, he passed his teammate Garry Maddox on the basepath. While hosting the HBO special The Not-so-Great Moments in Sports, McCarver later claimed to have said to the umpire, "I didn't pass him, he lapped me." Asked how Maddox could have done that, McCarver replied, "Sheer speed." The event was commemorated in the book The Baseball Hall of Shame 3 as "Tim McCarver's Grand Sob." McCarver finished his career as the personal catcher for Steve Carlton for the Phillies in the late 1970s. Carlton preferred McCarver to Phillies regular Bob Boone. It was quipped that when Carlton and McCarver eventually died, they would be buried 60 feet, 6 inches apart. He retired after the 1979 season to begin a broadcasting career. McCarver briefly returned to duty in September 1980, thus becoming one of only 29 players in baseball history to date to appear in Major League games in four different decades (1950s, 1960s, 1970s and 1980s). He caught 121 shutouts during his career, ranking him 9th all-time among major league catchers. As a broadcaster, McCarver has enjoyed prominence as a color commentator on the network level. He has won three Emmy Awards for Sports Event Analyst. He began his broadcasting career at WPHL-TV (Channel 17) in Philadelphia, where he was paired with Richie Ashburn and Harry Kalas for Phillies games, before co-hosting HBO's Race for the Pennant in 1978 and working as a backup Game of the Week commentator for NBC in 1980. McCarver has called baseball for all four major U.S. television networks. His work at NBC was followed by stints with ABC (where he teamed with Don Drysdale on backup Monday Night Baseball games in 1984 and Al Michaels and Jim Palmer from 1985 to 1989 and again from 1994 to 1995 under the "Baseball Network" umbrella) and CBS (where he teamed with Jack Buck from 1990 to 1991 and Sean McDonough from 1992 to 1993). McCarver was paired with Joe Buck on the Fox network's MLB telecasts, a role he held from 1996 to 2013. McCarver called his first World Series in 1985 for ABC as a last minute replacement for Howard Cosell. Cosell had been removed from the broadcasts altogether after excerpts from his controversial book I Never Played the Game (which was critical of Cosell's co-workers at ABC Sports) appeared in TV Guide. Perhaps McCarver's most notable assignment for ABC prior to the 1985 World Series was as a field reporter for the 1984 National League Championship Series. Also while at ABC, he also served as a correspondent and play-by-play announcer for Freestyle skiing at the 1988 Winter Olympics in Calgary. McCarver also co-hosted the prime time coverage of 1992 Winter Olympics with Paula Zahn for CBS. He has also called games locally for the Phillies from 1980 to 1982, Mets from 1983 to 1998, Yankees from 1999 to 2001, and Giants in 2002. However, McCarver wasn't able to call the World Series wins by the Phillies in 1980, Mets in 1986, and Yankees in 1999 (all three wins were broadcast on NBC, but McCarver wasn't part of the broadcasting team any of those times). 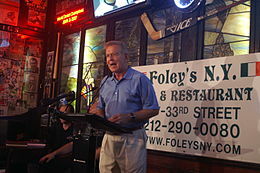 McCarver is the only sportscaster to have covered the New York Mets and two of their rivals on a regular basis. He is one of three sportscasters to have covered the Mets and the Yankees (the others being Fran Healy and Tom Seaver) and one of three sportscasters to have covered both the Mets and the Phillies (the others being Todd Kalas and Tom McCarthy). In 2003, McCarver set a record by broadcasting his 13th World Series on national television (surpassing Curt Gowdy); in all, he called 24 Fall Classics for ABC, CBS, and Fox. Also, from 1984 (when he served as a field reporter for ABC's NLCS coverage) to 2013 (when he served as color analyst for Fox's coverage of the ALCS), McCarver never missed commentating on at least one League Championship Series per year. McCarver announced March 27, 2013 that he would leave Fox after the 2013 season. His final Fox broadcast was October 30, 2013, as the Boston Red Sox defeated the St. Louis Cardinals in Game 6 to win the 2013 World Series. On December 8, 2013 he was hired to be a part-time analyst for the Cardinals on Fox Sports Midwest. He teamed with Dan McLaughlin to call 30 games in the 2014 season. His first game called for the Cardinals was on April 28, 2014, when they hosted the Milwaukee Brewers. At the conclusion of the season, McCarver stated that he had not yet decided whether to come back to the Cardinals' booth in 2015. However, McCarver returned to the Cardinals booth for 40 games in 2015, and has returned for a handful of games each year since. 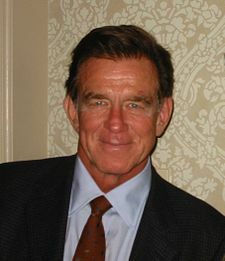 McCarver has also hosted a nationally syndicated sports interview program, The Tim McCarver Show, since 2000. McCarver has elicited criticism throughout his broadcasting career. While covering the Mets, McCarver criticized Darryl Strawberry for staying in the same place in the outfield, and overly deep, regardless of who the batsman was. He often said Strawberry would be better defensively if he made some adjustments. Davey Johnson, the Mets manager at the time, responded by saying that Strawberry saw the ball come off the bat better in that spot than anywhere else. During the 1992 National League Championship Series, he criticized Deion Sanders, who also had become an NFL star, for playing both sports on the same day. For his criticism, Sanders dumped a bucket of water on McCarver three times while he was covering the National League pennant winning Atlanta Braves' clubhouse celebration for CBS. After being doused with the water, McCarver shouted at Sanders, "You are a real man, Deion. I'll say that." Also during the 1992 post-season (when McCarver worked for CBS), Norman Chad criticized McCarver in Sports Illustrated by saying that he's someone who "when you ask him the time, will tell you how a watch works", a reference to McCarver's habit of over-analyzing. In Game 4 of the 1997 American League Championship Series, on a wild pitch with runners dashing around the bases, when umpire Durwood Merrill gestured to where the ball was, McCarver sarcastically commented that "maybe he was trying to tell himself where the ball is!" Merrill took offense to the comment, and fired back in his autobiography that he was letting the other umpires know that the situation was under control. When rule questions came up during a broadcast, McCarver misstated a rule. 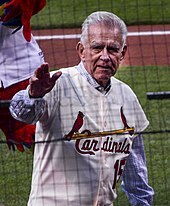 After a St. Louis Cardinals balk in Game 4 of the 2006 NLCS, McCarver explained, "You have to have 'one thousand one' when coming to a stop, and you have to stop your glove in the same place every time in front of your body," when the rules state that there must be merely a complete discernible stop anywhere in front of the pitcher's body; no certain duration or location is necessary. In October 2008, just before the 2008 NLCS, McCarver made public his feelings about Manny Ramirez, calling him "despicable" and criticizing Ramirez for his perceived sloppy, lazy play in Boston and how he had suddenly turned it around in Los Angeles. Ramirez declined comment. In 2010, he compared the New York Yankees treatment of former manager Joe Torre to the treatment meted out by Nazi Germany and Stalinist Russia to generals who fell out of favour with their leaders. After receiving negative comments on his position, McCarver apologized. On October 9, 2009, McCarver released a cover album of jazz standards entitled Tim McCarver Sings Songs from the Great American Songbook. In 2010, McCarver was inducted into the Irish American Baseball Hall of Fame. In July 2012, he was elected to the broadcaster's wing in the Hall of Fame. The minor league baseball stadium in Memphis was christened Tim McCarver Stadium in 1978; it was replaced by a new downtown stadium (named AutoZone Park in a naming rights arrangement) in 2000. McCarver, Tim and Danny Peary (1999). Tim McCarver's Baseball for Brain Surgeons and Other Fans: Understanding and Interpreting the Game So You Can Watch It Like a Pro. Villard. ISBN 978-0-375-75340-4. McCarver, Tim and Danny Peary (2008). Tim McCarver's Diamond Gems. McGraw-Hill Professional. ISBN 978-0-07-154594-5. McCarver was the subject of a "cutaway" joke in the "Mother Tucker" episode of the Fox animated sitcom Family Guy. When Brian is asked to accept Stewie as his co-host on a radio talk show, he sighs, "Well, I guess he couldn't be any worse than Tim McCarver is at sportscasting." This is followed by a scene of an animated McCarver declaring, "In my view, as good as the Yankees were in the first half of this game, that's how as bad they've been now." ^ Gammons, Peter (1985). Beyond the Sixth Game. Boston: Houghton-Mifflin Co. p. 73. ^ "Retrosheet Boxscore: Philadelphia Phillies 4, Cincinnati Reds 0". ^ "Retrosheet Boxscore: Montreal Expos 7, New York Mets 0 (1)". ^ "The Encyclopedia of Catchers – Trivia December 2010 – Career Shutouts Caught". The Encyclopedia of Baseball Catchers. Retrieved December 29, 2015. ^ "'I Am By No Means Retiring': Tim McCarver To Leave Broadcast Booth After Season". CBS News New York. Retrieved March 27, 2013. ^ "Tim McCarver Retirement: Joe Buck's Send-Off for Broadcasting Partner Was Classy". Los Angeles Times. Retrieved October 31, 2013. ^ Langosch, Jennifer (December 8, 2013). "St. Louis Cardinals set to add Tim McCarver to broadcast team". MLB.com. ^ Caesar, Dan (March 7, 2014). "McCarver completes deal for 30 Cards games on FSM". STLtoday.com. Retrieved March 10, 2014. ^ Justin Terranova (October 20, 2014). "Tim McCarver: 'Quasi-retirement could not have worked out any better'". Retrieved October 21, 2014. ^ McEntegart, Pete (January 14, 2007). "The 10 Spot". sportsillustrated.cnn.com. Retrieved September 3, 2009. ^ "Official Rules: 8.00 The Pitcher". MLB.com. Retrieved September 3, 2009. ^ McCarron, Anthony (October 8, 2008). "Tim McCarver calls Dodgers slugger Manny Ramirez 'despicable'". New York Daily News. nydailynews.com. Retrieved September 3, 2009. ^ "McCarver calls comments inappropriate". ^ "Books and CD - The Tim McCarver Show". ^ "Tim McCarver". irishbaseballhall.com. Retrieved October 22, 2012.